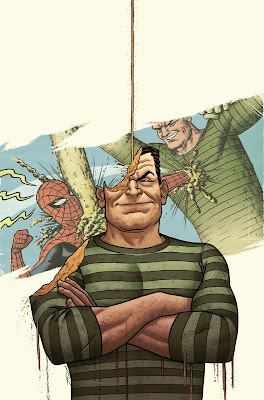 So Marvel just posted some variant covers I did for some upcoming issues of 'Amazing Spider-man.' 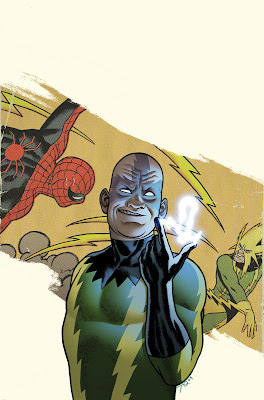 These are the first three in a series of villain-centric covers for the series showcasing the characters' new redesigns. Above is the redesign for Electro. Hope you like! Cool! I like the redesign of Electro. And that's a very smart use of Sandman's powers to get that arresting image of him. I think you've got some talent, kid. Thankee kindly, good sir. Likewise! Though actually, I should say I didn't actually do the redesigning here. I just did the illustratin'. Yes sir. Sorry sir. I'll try and do better. 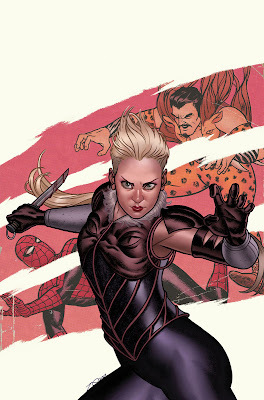 Seriously though, the girl here is the new Kraven, though I'm not sure if it's her daughter or not.... wikipedia! I meant HIS daughter. As in original Kraven's. Yeah. Wow, that looks really great. I wish they would just rotate you and Rivera on interiors. You guys look great together, achieve a similar flavor from different angles. Those covers are beautiful, can't wait to see more interior work from you! Hah, thanks Kyle! More interior stuff coming! ha. Great work. No attack on the art or course. I'd just love to get into a new story arc. This great art is a great start. I just wouldn't want a weird gimmick to kill that joy. Heh, no worries SD. Thanks for the kind words. Our girl's full name is Ana Tatiana Kravinoff, and yes, she's Kraven's daughter. These covers are stunning! I liked your process post as well, interesting to see how close you get in while shading. You've been busy since Wednesday Comics, I'm barely keeping up with you. I'll be sure to pick up the Amazing Spidey issues just for your covers and I'm looking forward to the Big Two using you more and more.